Towing a trailer can seem to you as a daunting task, here you will have to consider every minute details. You will have to be cautious while adding a couple of hundreds of pounds to the back since you have to make several changes in the rig. So, follow some simple guidelines to tow 4, 5, 6 trailers with utmost safety. Most hitches come with a removable drawer, and this drawbar holds the hitch ball. You can find drawbar in two different sizes, one is 1.25 inches and the other one is the 2 inches. Now hitch ball comes in three different sizes - 25/16 inches, 17/8 inches and 2 inches. Install the ball onto the drawbar to the proper torque. If the tongue loses its grip on the ball at the last moment, then the chains can be the last hope. They will keep the trailer from vaulting the guardrail into oncoming traffic. So, cross the chains under the tongue, if it slips by chance then the trailer will not set free, it will land on the crossed chains instead of hitting the pavement. This is one kind of industry-standard plug and socket wiring that helps connector to get attached to the tow vehicle’s equipment. Now spray dielectric grease to the equipment contacts to stop the corrosion. Trailers having electric brakes basically run on small gel-cell battery, and the battery gets charged whenever the truck is running. So, you must check the battery before your truck hits the road, faulty wiring can soak the juice. Use with a voltmeter to stay assure that the battery is alive if you find that battery dead, connect it to the external charger to make sure that the brakes are properly working. It is the downforce force from the trailer tongue to the towing vehicle hitch. Tongue weight basically controls the trailer when attached, thereby ensures you are safe to drive. Be carefully when calculating the tongue weight, improper towing weight calculation can lead to fatal accidents. There are a handful of ways to calculate the tongue weight, know the correct way to determine the tongue weight. Actually, it takes a hell lot of time to get the weigh-in right, so take time to learn and calculate and adjust the tongue weight. If you put too much tongue weight for gaining stability, then it can exert pressure on vehicle’s hitch. So, you must equalise the bars to induce a rotational force around the hitch and pivot and transfer some of the tongue weight to the vehicle’s front axle. 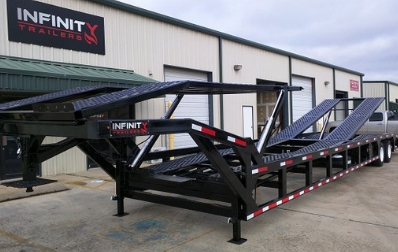 You have to consider all the above steps to tow a trailer with full safety. While towing 4 car trailers, 6 car trailers, keep in mind the following factors- attach chains, spray dielectric grease to the equipment contacts, charge your brake battery, set your tongue weight properly and set up equalising hitch.